Mercedes will let Lewis Hamilton and Nico Rosberg calm down before deciding how to resolve the controversy of their crash in Sunday's Belgian Grand Prix. The incident on lap two gave Hamilton a rear puncture that ultimately caused his retirement. Rosberg recovered from a damaged front wing to finish second. 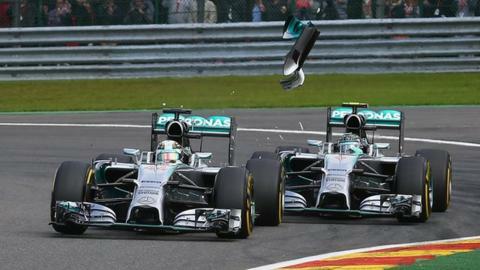 Hamilton said rival Rosberg admitted to causing the crash "on purpose". Mercedes F1 boss Toto Wolff said: "We will decide what to do when everybody is in a cooler, calmer frame of mind." The Austrian added that he was "very disappointed" with Sunday's events at Spa-Francorchamps and that Rosberg "shouldn't have done it" but said "there will be no knee-jerk reaction". Red Bull's Daniel Ricciardo won the race but Hamilton's retirement leaves the British driver 29 points behind Rosberg in the championship, with only 200 available in the remaining seven races. Mercedes have until this point allowed their drivers to race freely on the proviso they did not hit each other. Wolff said this philosophy would now change, but he did not yet know how, adding that he had not expected things to deteriorate this badly. "I thought with the two of them, with the way they have previously driven against one another, that it wouldn't come to this point," he said. "But we are at that point and it needs to be managed going forward." Wolff insisted the meaning of Rosberg's comments during a private team meeting after the race had been misinterpreted. Hamilton claimed that Rosberg said he had caused the incident "on purpose", adding: "He said he could have avoided it. He basically said: 'I did it to prove a point'." Lewis Hamilton's claims that Nico Rosberg crashed into him deliberately in Sunday's Belgian Grand Prix was the latest incident between the warring duo that has blighted a dominant season for their team, Mercedes.Read in full how the situation boiled over during the Belgian Grand Prix. Wolff explained: "They agreed to disagree in a very heated discussion amongst ourselves, but it wasn't deliberately crashing. That is nonsense. "It was deliberately taking into account that if Lewis moves then it could end up in a crash." Governing body the FIA is to consider whether to take any further action over the incident after stewards did not investigate it in Belgium. Officials at Spa-Francorchamps made their decision to close the case during the race, long before Rosberg had made his comments in the Mercedes meeting. The FIA will now have to decide whether to investigate what was actually said in the meeting and whether Rosberg's decision not to take avoiding action effectively caused a collision, which is an offence under the F1 sporting regulations. If the FIA rules that Rosberg is in the wrong, it will have to decide if there needs to be a penalty of some kind. Wolff, who has indicated Rosberg could face internal disciplinary action from Mercedes, added: "The incident, as I see it, is not acceptable for us. "What we saw there was that Nico was not prepared to take the exit, and that caused the collision. That is not something we want to happen." He added: "With hindsight, if he could turn back time, Nico would probably not do it again in the way he did."